Today I’m very excited to host T.J. Wooldridge, author of The Kelpie and president of Broad Universe. Welcome, T.J.! Thank you so much for having me, LC! 🙂 I’m happy to be here. So first, the quick and dirty! Tell us a little about yourself and your book! I’ve been writing all my life; I’ve loved horses all my life. Folklore and faery tales have always intrigued me for as long as I can remember–particularly equine ones: unicorns, pegasus (pegasi? ), hippocampus… The kelpie myth of Scotland is a dark, evil horse who lures children into the water, drowns them, and eats them. Some of my scariest moments and worst injuries have actually come from working at a horse rescue. Horses are herbivores and not predators, and they are quite terrifying! Imagine that kind of beast as a predator…how much damage that huge body, those heavy hooves can do–and make it worse with additional weapons like nasty teeth and fur that can entrap you. That…covers a lot about me and the book together. 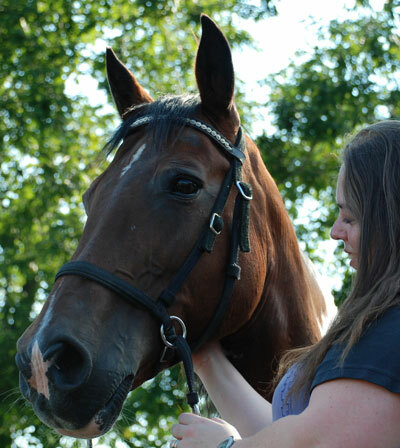 Of course, despite all my equine-related injuries, I still love the animals dearly. And I am donating a percentage of all my royalties to the Bay State Equine Rescue, to continue to help horses who have been abused, neglected, and abandoned. I was glad to see that The Kelpie stars a young girl who steps up to protect the other children in the area! The more female leads in our fiction, especially YA, the better, in my opinion! Did you make a conscious choice regarding the gender of your protagonist, or was it just the story you wanted to tell? My characters always tend to come to me. It’s not a conscious choice, but many of them end up being precocious girls; that’s the type of character my head attracts. And they’re all quite demanding in that I tell their story as honestly as possible. Which means it’s not even necessarily the story I want to tell. I had an entirely different ending in mind for Heather and the kelpie…but that ending was never to be and I had to go with the ending that would affect every other thing I would write in Heather’s world. Can you tell us a little about your hero? Is she someone to admire? What are her flaws? What are some of the challenges she has to face as she deals with the kelpie? Heather Marie MacArthur is definitely someone I admire. She has a strong set of ethics and morals; she truly cares about and wants to help other people. Her flaws, which she doesn’t see, is a certain level of vanity and pride that she totally can handle and fix every problem that comes her way. Granted, this comes in handy when dealing with the fey, who are more than a little vain and proud themselves, but it’s an awful lot for an eleven-year-old to handle. On top of dealing with the direct threat of the kelpie, Heather also has a lot of other issues in her life. She’s picked on at school because she doesn’t fit into any group. Her father is bipolar and is currently suffering the depression side of that–aggravated, unfortunately, by the presence of the kelpie. And Heather blames herself for that, too, because she’s afraid that the kelpie is attacking worse now because she accidentally angered it even worse. Heather’s best friend, Prince Joseph, also brings another set of problems to the mix by being of royal blood, the issues that go with that (press conferences, having to keep up appearances), and the fact that his family–like just about every family, has their own set of issues. And, of course, Heather wants to take care of her best friend, too. I’ll admit–it’s been a long time since I’ve read YA fiction outside of say, Harry Potter or The Hunger Games. What’s the landscape like out there for female heroes? How do you think speculative fiction YA compares to adult SFF fiction? What’s it like for female authors in the genre? Spencer Hill Press, the company who is publishing The Kelpie, is primarily comprised of female YA authors, most of whom write female lead characters. In the YA realm, I think there is a good collection of strong women writers and strong–in many ways–female lead characters. There are also varying levels of romance in most of these books, too; very few flat out adventures. When I’ve gone to convention and conference panels that discuss middle grade books, the majority still have male protagonists because “boys don’t read girl books, and we need more boys reading” while it’s a given that girls who are readers will read just about anything. And there are clearer gender lines between books. Take a look at Diary of a Wimpy Kid versus Dork Diaries. Can you tell who the target gender demographic is for each book just by looking at them? Which one has a clearer target gender? Now…which do you think sells more? You’ll also find more women writing under their initials, as I do, because a boy wouldn’t necessarily read a book with a particularly feminine author name. You’ll notice on my cover that I’ve got both Heather and Joe, and it’s teal green…boys won’t pick up a book if it’s just about a girl or remotely looks girly. Now, how much of that is parents and teachers perpetuating this, I can’t say. But, I did make a conscious choice to use my initials and make my book appear as non-gender-specific as possible in hopes that more boys might take a chance and find that girl stories aren’t nearly as scary as they think or have been led to think. Broad Universe has a great mission and offers a community to women writing SFF and horror. How has the community has helped you, influenced or inspired you as you wrote and published The Kelpie? In one word, immensely! I met Kate, owner of Spencer Hill Press, and my editor, Vikki, through being active in Broad Universe tables and panels at conventions. I’ve got some really good presales on the book in places I’ve never been…and I believe it’s from the Broads I’ve made friends with requesting it at bookstores. I posted to the Broad Universe list for my blog tour and got so many people willing to support and help me out, I was blown away. I tried to answer everyone, and there were more people than slots in my blog tour! And I’ll have an excerpt from The Kelpie on the December Broad Pod. And my publicists, Kendra and now Jenn, are also a Broads. Kendra made sure that I got my cover reveal scavenger hunt accomplished back in March. When Kendra had to leave, Jenn stepped up and helped me do just about everything social media wise. She set up my blog tour and had her husband make the awesome trailer. The art in the trailer is done by Kendra’s sister! Oh! And my awesome writers group who critiqued the crap out of my drafts are all Broads, too. The whole project has been Broad-touched since before I even signed the contract. Ok back to your book! The kelpie is not a monster you see a lot of–what drew you to it? Is the kelpie in your story very traditional, or have you put your own spin on it? Did you have to do a lot of research into kelpie mythology? As I mentioned above, there’s the equine aspect that automatically draws me in. I don’t remember when I’d first heard the kelpie myth, but it’s not one you hear often. I have definitely put my own spin on it, but there is an awful lot that I drew from the traditional Scottish folklore…down to people “sticking” to the fur while they get dragged into the water. I have the fur like tiny tentacles that hold you like Velcro–which, I also learned, was invented in Scotland! The story of the bridle one must use to capture the kelpie…and the demise of its various owners… also comes from traditional folk tales. What were some of the challenges (if any!) you had during the writing of The Kelpie? Was there a particularly tough plot twist, or anything you agonized over during revisions? Anything that just flowed as if it were inspired? Lots. My general writing style is to write BIG. The rough draft word count was just about 100k words, which is far too long for a debut middle grade novel. And…honestly, I just had too much in there. In the drafting, I really did have a very different ending in mind, but it just wouldn’t work for Heather. It wouldn’t be real for her. So I had to work that out. And then I had to cut an awful lot of her family’s backstory, which was also hard. We’re all informed by our families, and the stress of our families has an immediate effect on us all the time. But I had to leave a lot to suggestion or cut it out and focus on the most immediate effects. What just flowed was whenever Heather and Joe were on the screen together. The two have a great friendship chemistry and they work well together. Joe has a different kind of pride and vanity than Heather, being a prince and all, and Heather keeps him in check. Joe, on the other hand, is always giving Heather a reality check that not everything can be easily fixed…and sometimes you need a little help to deal with things. If it isn’t spoilery, what’s your favorite part of the story? As a reader? As a writer? I have a few favorite parts. Probably my favorite of favorites is Chapter 14, when Heather and Joe run into the castle ghost who is trying to help…or would, if Heather wasn’t so freaking terrified of her. Not that the ghost is particularly friendly, either. And Joe has to mediate. I also love writing the scenes with the various fey. Tom, the cat fey, is, well, in his own words, “I’m a cat.” One of my other editors, Laura, is particularly fond of Chapter 6, entitled, “Because research always needs snarky talking cats.” And that sums up Tom. Lady Fana and Lord Cadmus are the ruling daoine síth of the region who Heather has to deal with to get some help protecting one of the children targeted by the kelpie. And then, when the kelpie gets “on screen,” well…he is the book title after all. Who was your favorite character to write in the story? Was anyone your least favorite to write? Did ease of writing equate to liking or disliking the character? It’s all written in Heather’s point of view, so everything is seen through her eyes. Fortunately, I made her half-American, which gave me a little cushion in dealing with Scottish culture…and particularly in trying to write a royal family and the whole idea of what nobility and peerage is–something truly foreign to an American. So, all the scenes with Joe’s family, particularly when his grandmother, the Queen, shows up, were especially difficult to write because I was constantly double checking all my etiquette and trying to be respectful to actual people who have these titles. That said, there were two characters who I truly disliked, and are pretty much meant to be disliked for certain. One is Joe’s uncle. While he is a vile person, part of the dislike in writing him came from trying to not have that necessarily cast a negative light on royalty or peerage as a whole group and culture. The other is Jessica, who is the mother of Heather’s half-sister, Lily. And I don’t have the same excuse for not liking her as I do Joe’s uncle; she just came to me as a particularly nasty character. Sometimes writing isn’t the hardest part–what did you find toughest about bringing The Kelpie from manuscript to published book? Gack, social media everything!! Let me just put another shout-out to Jenn, my publicist, who made me a Goodreads page, reminds me to do stuff, and is extremely patient and holds my hand while I try to navigate doing crap online. I hate it; I really do! I love interacting with people and writing, so you’d think I’d enjoy it. But no. I’ve done a particularly crap job on my own blog and my webmistress is always reminding me to actually send her information to update on my website. I’m glad Jenn organized the blog tour! I love writing articles and doing interviews…but I wouldn’t know how to tie them all together, run a giveaway, or anything else cool like that. Last but not least: how are you feeling, now that your book is out? Spill! We want to share in the thrill of it :). Besides that, just wow! I’m much better at thinking up words to describe evil child-eating faery horses than myself… so I’m sorry I can’t be more descriptive. Squeee!! T. J. Wooldridge is a professional writing geek who adores research into myth, folklore, legend, and the English language. Before delving full-time into wordsmithing, she has been a tutor, a teacher, an educational course designer, a video game proofreader, a financial customer service representative, a wine salesperson, a food reviewer, an editing consultant, a retail sales manager, and a nanny. While infrequent, there are times she does occasionally not research, write, or help others write. During those rare moments, she enjoys the following activities: spending time with her Husband-of-Awesome, a silly tabby cat, and two Giant Baby Bunnies in their Massachusetts home hidden in a pocket of woods in the middle of suburbia, reading, riding her horse in the nearby country stables and trails (not very well), reading Tarot (very well), drawing (also not very well), making jewelry (pretty well), making lists, and adding parenthetical commentary during random conversations. She also enjoys dressing up as fey creatures, zombies, or other such nonsense at science fiction, fantasy, and horror conventions. 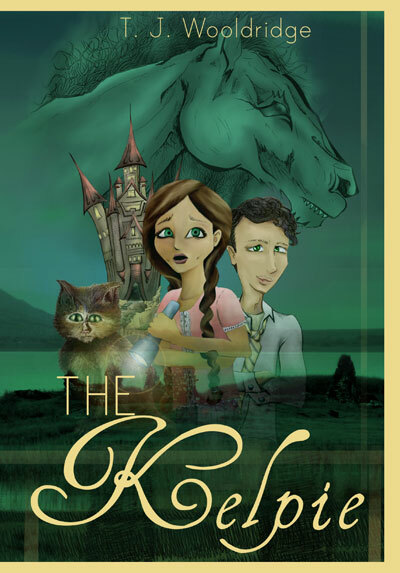 You can learn more about The Kelpie and T.J. Wooldridge over at her blog, A Novel Friend.